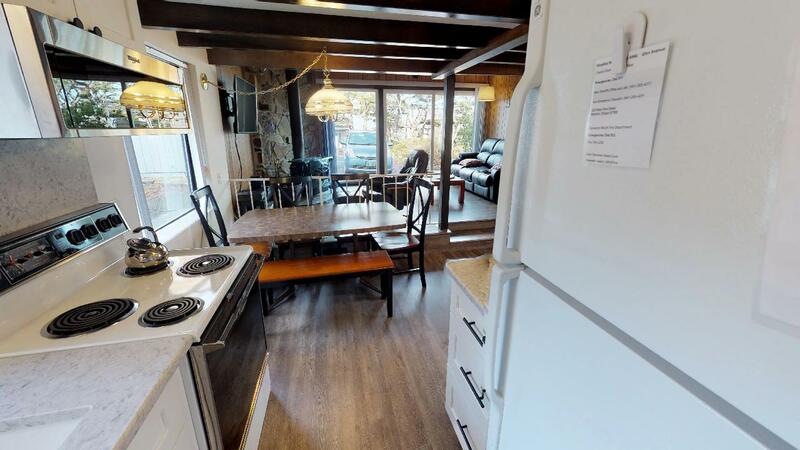 Welcome to Woodley Beach House, located in Gleneden Beach, just a few short minutes drive south of Lincoln City! This beautiful two story home offers two bedrooms and two baths with space for up to eight guests! Step through the front door and get ready to relax and enjoy what the Oregon coast has to offer! You'll find a cozy living room area with a brand new sleeper sofa and leather chairs next to the large flat screen TV where you can watch a movie on rental provided Netflix or sit and chat with a fresh cup of coffee in the early morning hours. There's even an old wood burning fireplace to use on those chilly Oregon nights or dewy mornings. Check out the view from the new bay windows while relaxing in the living room, or just take a stroll out onto the brand new deck! Take a quick trip out into the front yard for some sun or to enjoy the smell of the ocean breeze. You can even see the blue of the ocean from the living room. Next to the living room, you'll find the kitchen and dining room area. The kitchen has everything you'll need to whip up a quick homemade meal while on your trip. 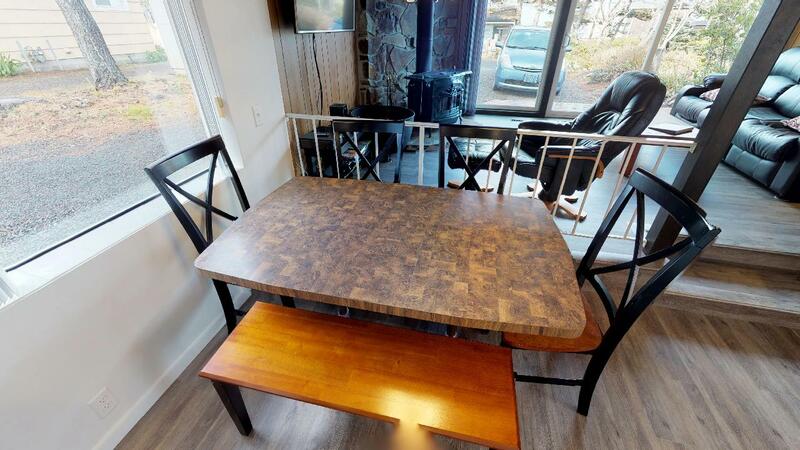 The dining room table seats up to six guests, but with the living room close by, guests will have no problem communicating with one another over meals. Time to check out the sleeping arrangements! Each bedroom contains a king size bed. This room offers a beautiful view of the ocean. The downstairs bedroom has a bathroom with a walk-in shower. 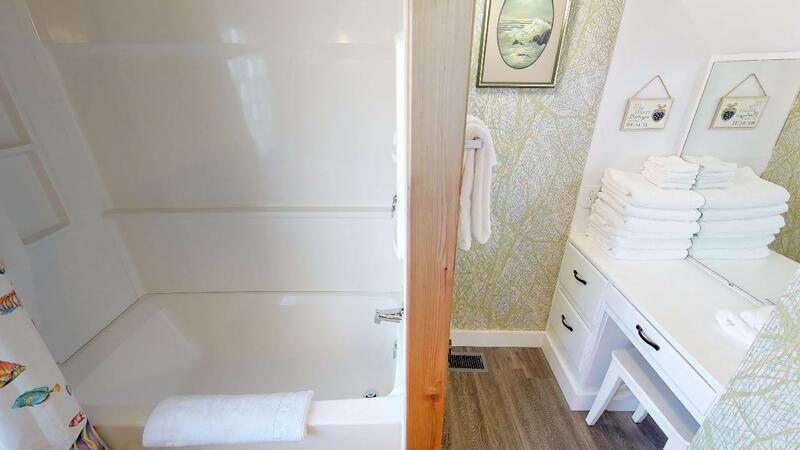 The second downstairs bathroom contains a walk-in shower and a tub. 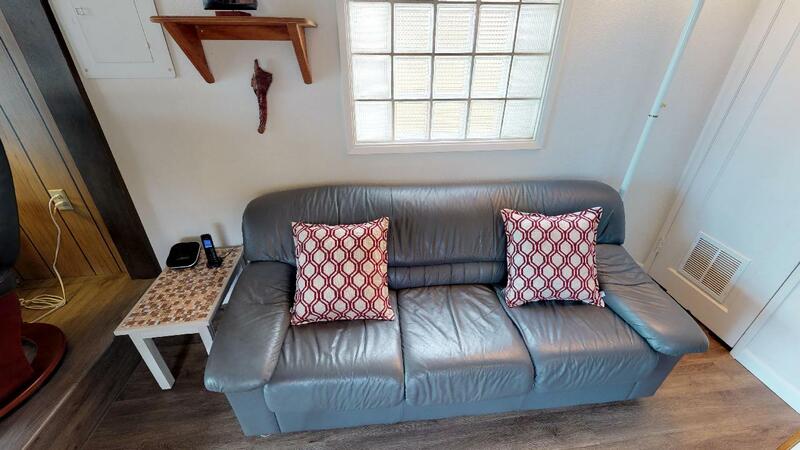 There is also a sleeper sofa in the living room and a double size bed off of the stairs on the second floor, perfect for any kids in your party. Beach access is just one block away, or you can head up to Lincoln City and check out the beach access via the Siletz Bay, just behind Waters Edge Condominium. You'll also find plenty of things to do while on your stay, including golfing at the Salishan golf course, shopping at the Lincoln City Outlets, catching a bite to eat at any one of the many restaurants in town, or even creating your own glass float. Don't forget! Lincoln City runs Finders Keepers every October through May on the Lincoln City beaches. Try your luck at finding a glass float you'll get to keep forever. You'll have many things to see and do while staying at Woodley Beach House, so book your stay with Oregon Beach Vacations today! Beach access: about 2 blocks go over to Fern St turn right go to Neptune turn right walk down street to the curve and access is there. "Beautiful Beach House! Lights on and Welcoming from stepping through the door! Very comfortable, nicely decorated, had Everything we needed! Nice neighborhood, quick walk to the beach, and felt right at home?? Loved the location, being away from the traffic and crowds of Lincoln City. Didn't mind the beautiful drive to town! Great place for a family, also for " girls trip " ( or guys! ) We'll Definitely be coming back!!!" "Very sweet little beach house. Close to beach access, well stocked kitchen utensils. Would have been 5 stars, but we were led to believe there was Wi-Fi and there wasn't yet. Though they are working with utility company to get wi-fi in the near future. The down stairs was a bit musty smelling, but perhaps a dehumidifier could help resolve that. We enjoyed our visit and will be back. " 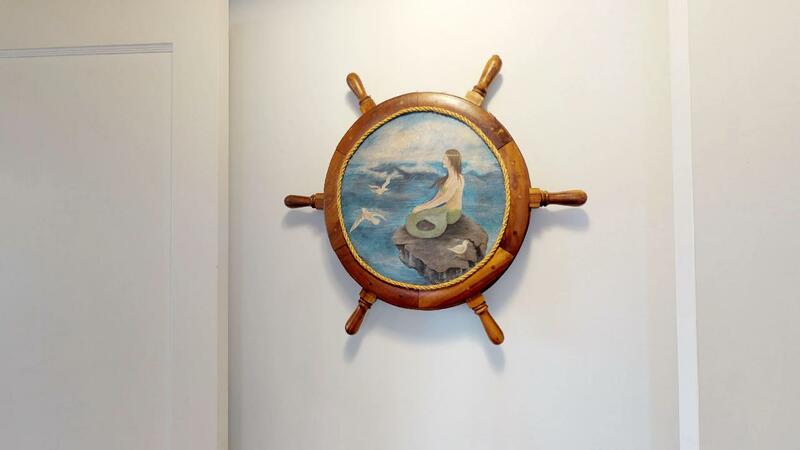 "I was thrilled to find this beach house available on the Thursday before Labor Day. We enjoyed our stay, but I do think it was a bit overpriced for what is offered.Pros:Good location with a small view of the ocean out the front window.Nice quiet neighborhood.Short walk to the beach access.Very clean.Great internet and lots of board games.Comfortable living area and beds.Cons:Very moldy/musty smell when you walk in.Kitchen adequately stocked with basics. Could use a larger skillet and colander.There was no carafe for the coffee maker : (Unusual layout with master bedroom/bathroom downstairs. Another full bathroom off the kitchen and 1 bedroom with loft upstairs.No yard, deck or patio and no grill.Overall we enjoyed our stay and would consider going back, but I’ve stayed at other beach houses for that price with better amenities."